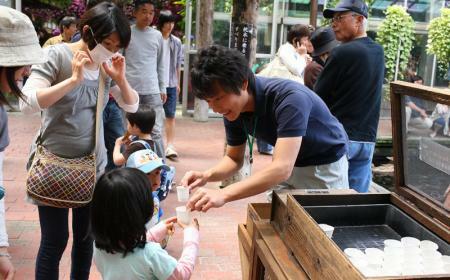 On this issue we show you some staff members that greeted the visitors during the "Golden Week" Holidays. 오늘은 고르텐위크기간에 바삐 돌아치는 당원의 스탭들의 모습을 소개드리겠습니다. 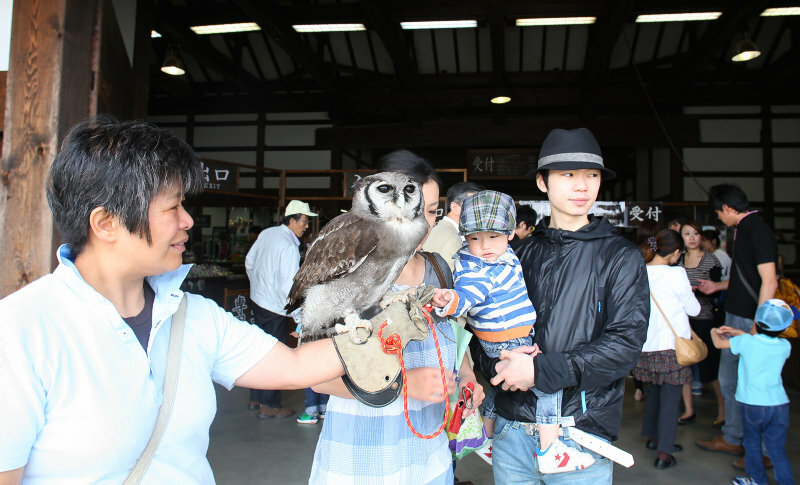 Above picture shows Jeremy the Verreaux's Eagle Owl and Ms. Kawai that is in charge of greeting visitors at the entrance except for the show time. Quite a few visitors are surprised to see a big owl in front of the Garden, some even take some souvenir pictures. 사진은 당원의 입구에서 손님을 맞이하고 있는 큰 수리부엉이 제르미와 카와이스탭입니다.카와이스탭은 비행쇼와 부엉이와의 만남이벤트외에는 입구에서 손님을 맞이하고 있습니다.제르미를 보고 놀라움에 금치 못해 눈이 동그레지는 손님,그리고 제르미와 사진을 찍는 분들도 적지 않습니다. 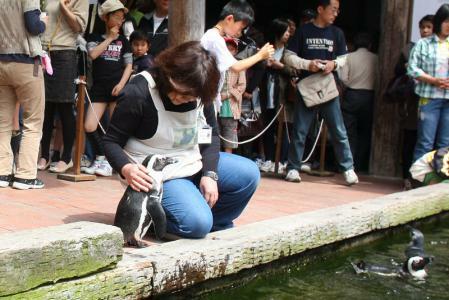 Ms. Maehata is gently embracing a penguin just taken out of the pool during the Penguin Feeding Event from 10:00. Usually in charge of sales promotion, she is also in charge of this event except when she's off. 10시부터의 <펭귄에게 먹이주기>코너에서 못에서 꺼낸 펭귄의 어깨를 다독여주고 있는 마에하다.마에하다는 평소에 영업홍보담당으로서 취재로 온 텔레비국의 손님을 접대하군 하는외 <펭귄에게 먹이주기>도 담당하고 있습니다. 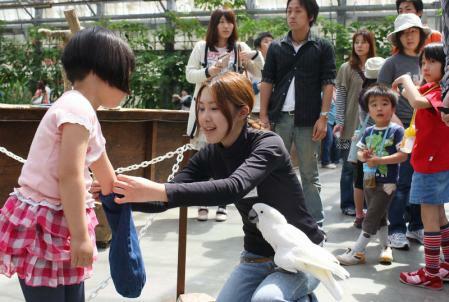 Ms. Goto puts a glove on an arm of a visitor girl during the Handling Event of Cockatoos and Macaws. 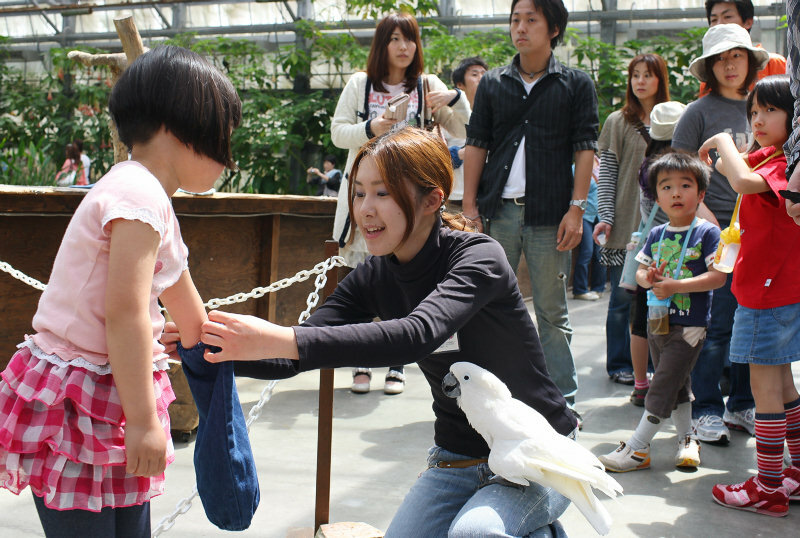 Tai the Umbrella Cockatoo is perching on her lap. <대형앵무새를 팔에 얹히기>코너에서 여자어린이에게 팔토시를 씌워주고 있는 고또스탭.고또씨의 다리에는 엠브렐러잉고 타이쨩이 기다리고 있습니다. 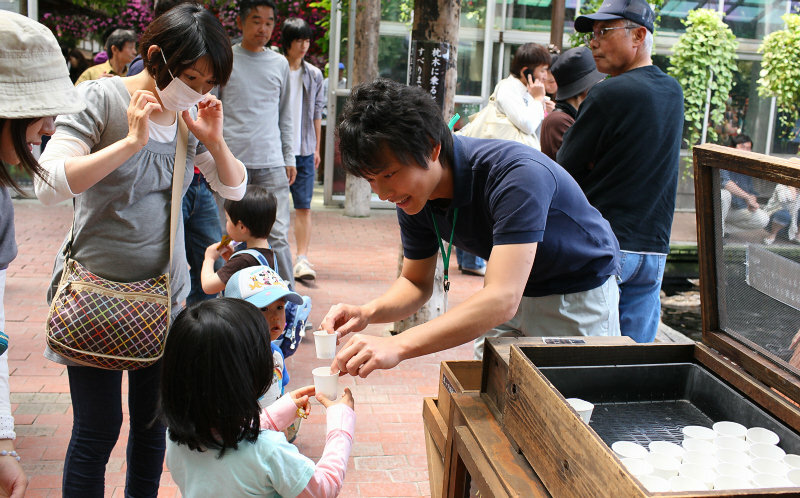 Mr. Mizuno, a staff member in charge of waterfowls, hands a cup of food to each visitor. He is also in charge of events of Penguins. 물새못에서 물새들의 먹이를 손님께 나눠드리고 있는 미즈노군.미즈노군은 펭귄에게 먹이주기체험과 펭귄과의 기념촬영도 담당하고 있습니다. Ms. Mizoguchi a flower staff member is selling Someii Boxed Lunches and Chimaki dumplings at the temporary stand for the "Golden Week" Holidays. 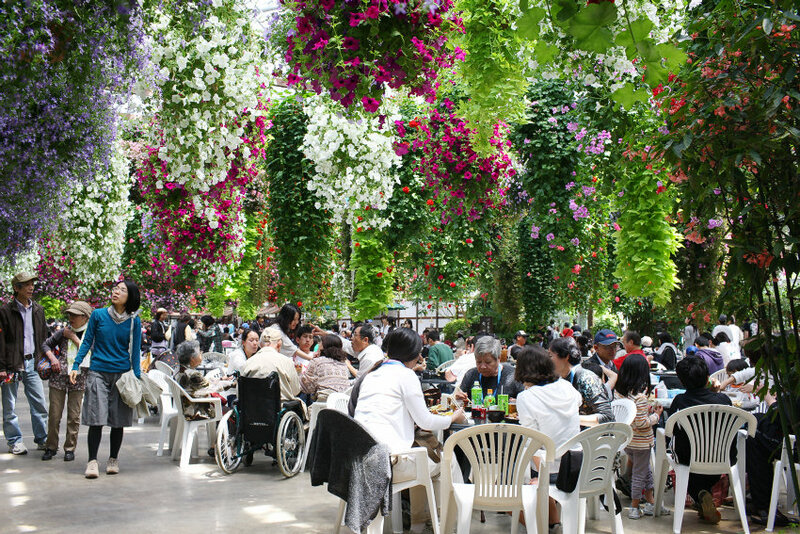 Usually in charge of maintenace of aerial flower garden above the Buffet Restaurant, she is in charge of the stand. 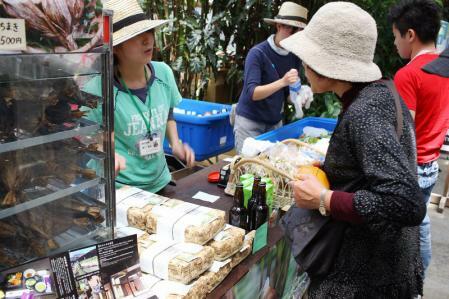 The lunches produced by Kamo Garden sold out by a little past noon. 고르덴위크기간에 임시로 세운 판매부스에서 자매원인 카모꽃창포원의 소매이이도시락이랑 치마키를 팔고 있는 식물스탭 미조구찌.미조구찌씨는 평소에는 바이깅위의 임파첸스를 돌보고 있지만 고르덴위크기간에는 판매원으로 변신하였습니다.도시락도 점심이 지나자 인츰 다 팔려버렸습니다. Tables in front of the stand. This place is loaded with visitors only at this time of the year. Apart from the Buffet Restaurant, baskets of Petunias and Ivy-Leaved Geraniums hang above the corner, creating a different atmoswhere and natural beauty. 임시판매부스 맞은편의 객석.평소에는 손님이 별로 없는데 이 기간에는 손님으로 좌석이 꽉 찼습니다.여기는 머리위의 식물이 바이킹과 많이 틀려 또 다른 분위기를 느낄수 있습니다. 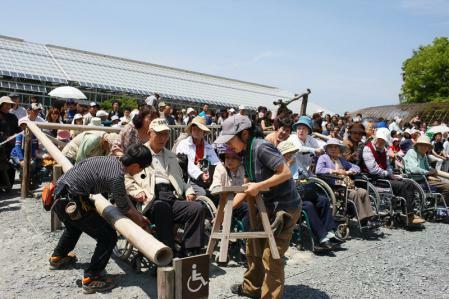 Ms. Sakayama(left) and Ms. Ozawa(right) the trainers, guiding visitors wheelchairs just before the flight show from 13:00. Not only to handle owls during the show, they also take good care of disadvantaged visitors before the show. 오후 1시의 비행쇼가 시작되기전에 훨체어로 오신 손님을 안내드리고 있는 사카야마(좌)와 오자오(우)스탭.쇼 진행중에는 부엉이와 대화를 나누는 한편 좌석 맨앞에 앉아 계시는 손님께로의 세심한 배려도 필요합니다. 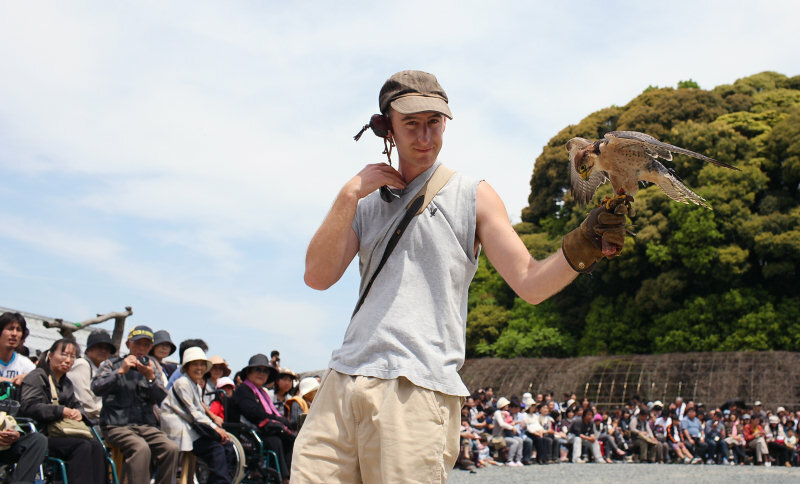 Gary the trainer-in-chief leaving the show site after the flight show of falcon. 마지막으로는 매의 쇼르 끝내고 퇴장하는 갸리씨입니다.